ROTTERDAM (Panorama): «Rotterdam is the biggest logistics hub in Europe, and most merchandise you can buy on this continent passes through there,» said Harald Martin Hjelle, the HiMolde associate professor of logistics. That is one of the reasons why on March the 13. the Logistikkforum, with 29 Norwegian and international students, set off on a three- day field trip to Rotterdam in the Netherlands, where everything from q-tips to cars are being discharged and loaded on vessels sailing around the world. «Understanding hubs like Rotterdam in reality, and not just from textbooks, is really helpful and, I believe, very motivating for our logistics students,» added Hjelle. Indeed, the interest in this field trip was rather large among the students. «On the day we opened the sale of tickets at the book store on campus there was a queue even before the store opened, and the tickets were sold out in 10 minutes,» said Mikkel Eine Furuset, a student and one of the organizers of the field trip. That is not surprising considering the fact that after the iStudent, HiMolde and Logistikkforum funding, the price of this trip was just 1625 NOK including travel, accommodations and breakfast. «We wanted to offer more places for students, but it was the first time we were organizing a trip like that, so we did not want to bite off more than we could chew,» said Mathias Hannsen, another organizing member of the Logstikkforum. To give credit where credit is due, thanks go out to the NCL shipping company for helping provide a beneficial trip to the logistics students. Arne Jackobsen, the founder and CEO of the company (and former student of HiMolde), is also appointed as one of the members of the school board. He sparked up the idea for the destination of this trip because one of the company’s bases of operations is there. NCL took the students on tour around the Rotterdam harbor and the Europe Container Terminal Delta to show them the ropes. And it was a lot to show indeed. The NCL alone takes care of the cargo on 300.000 vessels, which is just a segment of what travels through the ECT Delta Terminal. Logistics connected with motions are truly gargantuan. Observing the synchronized motion of manned and automatic cranes in combination with AGVs (automatic guided vehicles) moving cargo containers from vessels to trucks, trains and vice versa feels almost magical. In places like this, there is always a space to employ former logistics students. «Increasingly important is to also have an understanding of the hinterland logistics. The deep sea side of the problem ceases to be enough,» said Theo van Zijl, the Commercial Executive at ECT. Unfortunately, because of the weather condition at Haugesund, where the NCL’s headquarters are located, Arne Jakobsen was unable to fly to the Netherlands and give a lecture on the NCL’s operation. Luckily, it was taken over by Kees Groeneveld, another executive at NCL, who would like to see some logistics students from HiMolde come to work for NCL in the future. «It is always nice to have a fresh international attitude in the company. We have many Norwegian customers and they love talking Norwegian while they do business. We offer internship programs and lacking the knowledge of Dutch language is not an issue,» he added. Besides this main day of the program, a lecture at the Erasmus University of Rotterdam and a guided boat tour around the center of Rotterdam harbor were prepared. 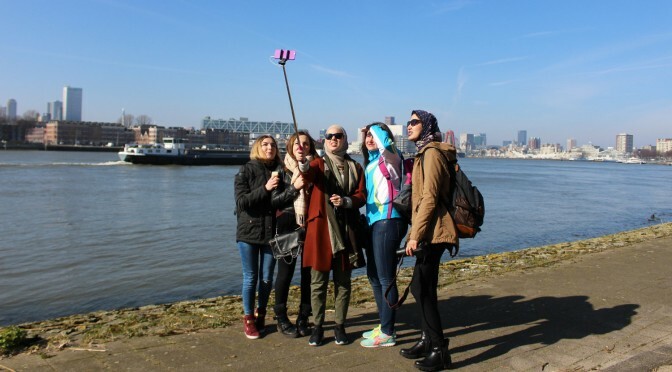 Students were also left with enough free time to explore the city of Rotterdam, with its amazing and unconventional architecture and other perks, such as night life very different from the one in Molde.